I hear it daily from friends and colleagues. From the news and every self-help guru. Today’s society, with information coming at us with full speed, is harmful and we’re not meant to live like this. It’s hurting us, and people are burning out and not capable of dealing with this stress. We have more people than ever suffering from stress and overwhelm. At the same time, we’re working and hustling and being bombarded by information from all angles. Social media, news and being online 24/7 means we’re never off. Always a stream of information invading our space. So we innocently assume that’s the cause of our burnout. Of our suffering. The correlation is strong, right? Too much information, too much to do, no time, which must equal why I’m stressed and about to collapse. The most obvious thing to do (and what stress ”officials” tells you to do) is to DO less. The consensus is that we must change how we work, we must change jobs, we must go to ”stress therapy” and talk about all the reasons why we’re feeling stressed…so we can change everything that’s causing stress. We are advised to take time off. We need to DO less. Change our behavior and our environment. Because if your job is causing you stress, then your job needs to change. If your boss is causing you stress, then you might need a new boss. If your commute is causing you stress, then it’s time for a new office, if your lack of a job is causing you stress then you need to take more action towards getting a job and however you try to look at the problem of stress and overwhelm it’s always something outside of us that created it. Our crazy modern environment creates stress. That’s what they say. Not because it’s not a good idea to slow down, have more free time and change your job…or just find a job. But because stress is only ever caused by our own thoughts. It’s never about the things we do. You might be thinking right now that ”It can’t be true. My job is stressful for real! I have too much to do and my boss is a jerk”. Yeah but no. Stress starts from within. 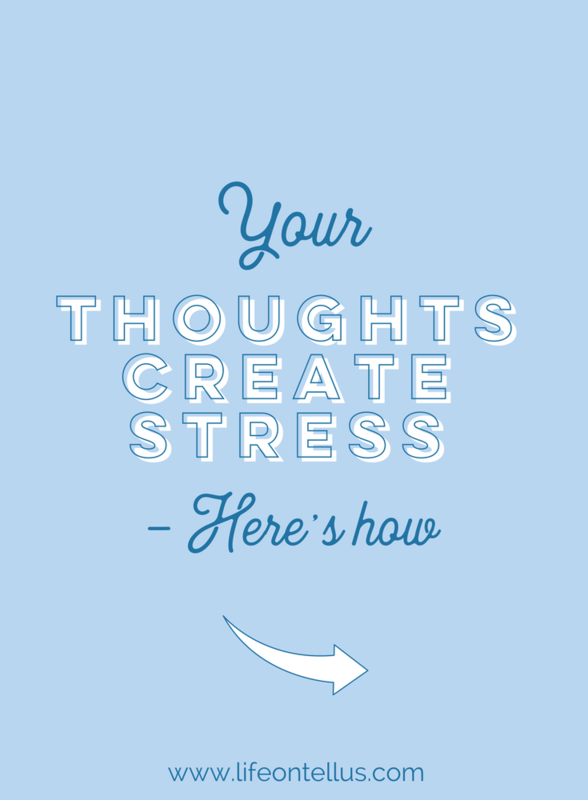 It starts with thoughts that create the stress and overwhelm. Thoughts and thoughts only create our experience in life. Thoughts color our feelings. Meaning, if you have a thought that screams ”There’s too much to do, I can’t handle this” then (if you’re unaware of it) it’ll create a feeling…probably a stressful feeling. We falsely believe that the stress we’re feeling is caused by the situation. But no. Again, it’s the thought ABOUT the situation that got you all down and overwhelmed. The question then is, if it’s not what we DO, if it’s just thoughts, then what do we do about it? How do we create a life with no stress but instead a life filled with ease? Does this mean then that we shouldn’t slow down and do ”stress-reducing activities”? Not at all. We can do all kinds of things to reduce our stress, but it’s still not gonna change anything unless we truly understand where stress is really coming from. From the inside. From our thoughts. And here’s the thing. Stressful thoughts follow us everywhere. Yes. There you were again. Changing jobs. Slowing down. And still feeling stressed and overwhelmed. Frustrating, right? Then you start looking into other areas of your life that need to change for you to feel at peace. You might look at your friends, partner or any other area that might be causing you stress. ”Maybe it’s the people at my gym? Yeah! I’m gonna sign up for a yoga class. Yoga is supposed to be good for you”. But then there you are, on the yoga mat, still kinda miserable and overwhelmed. Again, not the yoga. But your thoughts. Your thought creates your experience, the good, the bad, the ugly. It’s never the people in our lives; it’s never the events or situations. You should always upgrade. But what’s causing you suffering is your brain. Period. So how do we then go about this, then? How do we create a stress-free life? It’s as simple as that and as complex as that. Mindfulness and observing what’s going on in that inner world of yours is what will eventually show you the workings of the mind. The more you’re curious about how the mind operates, the more you’ll start to see that ”Oh! The brain produces a bunch of thoughts…and oh! I don’t really have to pay attention to those thoughts”. That’s when you’ve reached the point of no return. Because then you’re onto the brain and its shenanigans. You start to see that it produces a bunch of random and meaningless crap and that most of it are not even about you or personal. On the contrary. It’s very impersonal, and thoughts come and go on their own will. Like Dr. Amy Johnson says ”there’s nothing you must do.” Yeah. There’s nothing we must do with our thoughts. We don’t have to ”manage” them. We don’t have to analyze them. We don’t have to change them. They change on their own. Yeah. Really. So all you have to ”do” is simply see that your thoughts, and therefore your experience of life, is always changing. All you need to do is let the stressful thoughts go. Let them come, let them pass. No need to get all tangled up in them. It will show you that you are at peace in ANY situation you’re facing. Regardless of your work, regardless of your boss, your partner, your kids or any other situation you’re facing that you’ve falsely believed in the past has caused you stress. Knowing this gives you freedom. You’ll be bringing your own little inner freedom wherever you go.